The Green pea (Pisum sativum), a member of the legume family, is rich in health promoting phytonutrients, minerals, vitamins and antioxidants. These nutritious legumes contain a wide variety of phytochemicals such as flavanols (including catechin and epicatechin), phenolic acids (including caffeic and ferulic acid), carotenoids (including alpha- and beta-carotene, lutein and zeaxanthin), saponins (pisumsaponins I and II and pisomosides A and B) and polyphenols (including coumestrol), as well as ellagic acid and the phytosterol β-sitosterol. The compounds are said to be responsible for antioxidant and anti-inflammatory activity, supporting a healthy immune system, and are known to support healthy cholesterol and blood glucose levels. Green peas are also a very good source of the antioxidant vitamins C and A, as well as containing vitamin K, which contributes to bone and nerve health. Peas are also a source of essential B-complex vitamins such as folate, pantothenic acid, niacin, thiamin and pyridoxine, as well the minerals calcium, iron, copper, zinc, phosphorous, magnesium, potassium and manganese. Although starchy, green peas are a good source of soluble as well as insoluble fiber, aiding the gastrointestinal system, promoting satiety and contributing to healthy blood glucose and cholesterol levels. They are also low in fat and a good source of high quality protein. 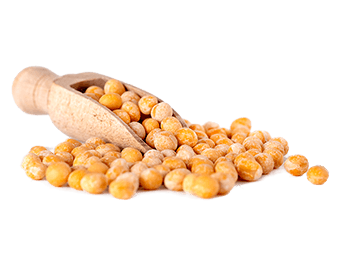 Whole dried yellow peas are used to make Pea Protein, an earth-friendly protein ideal for vegetarians/vegans and those looking for a superior quality plant-based protein. Pea Protein contains 9 essential amino acids with exceptional levels of lysine and arginine. Lysine is the precursor of carnitine which converts fatty acids into energy and helps control cholesterol levels. Lysine also keeps the immune system healthy and plays an important role in collagen formation necessary for healthy skin and bones. Pea Protein is likewise a great source of branched chain amino acids, which makes it ideal for athletes and exercise buffs to help them recover easily after strenuous workouts. Pea Protein also provides iron and beneficial phenolic compounds with antioxidant properties. NP Nutra® tests each lot of Pea Protein 80% (organic) to ensure that this product is always GMO free.